The CTI Water Chlorinator is a cost-effective, non-electrical water disinfectant system that was designed for communities with gravity supply water systems. 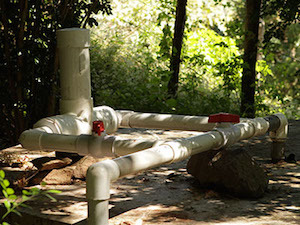 For under $150 dollars, chlorinators can be made with simple PVC piping and installed by villagers. Safe water can then be supplied to an entire village within hours. After attaching to a gravity-fed water tank, the CTI Water Chlorinator delivers a controlled dosage of chlorine to a community’s water tank. The chlorine kills most disease-causing pathogens, making the water safe to drink. CTI has installed water chlorinators in over one hundred rural communities in Nicaragua, providing safe water to more than 190,000 villagers. Community water groups maintain the appropriate chlorine levels and pool their resources to pay for chlorine tablets. Involving village groups fosters local ownership of the equipment, an important part of ensuring the program’s sustainability.